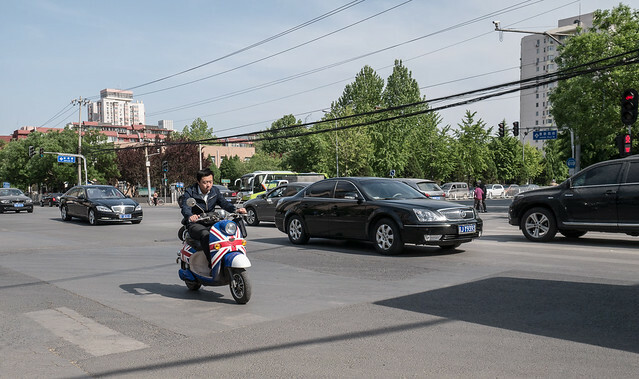 If the scooter sporting the Union Jack isn’t enough to convince you, take a look at the three cars next to it… a Buick, Mercedes Benz, and a BMW. Shameless plug time… if you’re interested in seeing more about cars here in Beijing, checkout carsofbeijing.com. I had the camera, which was in sleep mode, at my side when I saw this. The wake, focus, and shoot times were impressive. Posted in Beijing Youjian and tagged Asia, beijing, beijing youjian, Buick, cars, china, Lumix DMC-GX7, Mercedes Benz on 2014-05-9 by sujinyan.